My toes know it’s cold outside. My nose knows too. And my ear. Our thin nylon tent holds little warmth. Last night the mercury fell to –2°C in the mallee. Cold on the extremities, but not cold in the extreme. Cold in the extreme? Last seen, winter ’82. Every winter, the small town of Ouyen – a grain silo, roadhouse, general store and little more – gets about 18 frosts. Most years, the coldest night is a chilly –1°C. Thirty two years ago, the mercury plummeted. In the early 1980s, Australia was crippled by drought. Between dust storms and bush fires, El Nino brought clear days and cold nights. Friday morning, June 4th 1982 was colder than usual: –2.2°C. The next five nights were colder again. Saturday hit a record low: –4.8°C. Pity the publican hosing the footpath outside the Victoria Hotel. A month later, the frosts returned: –2.2°, –5.8°, –3.2°, –2.4°, –5.0° and –2.0°C, night after night. 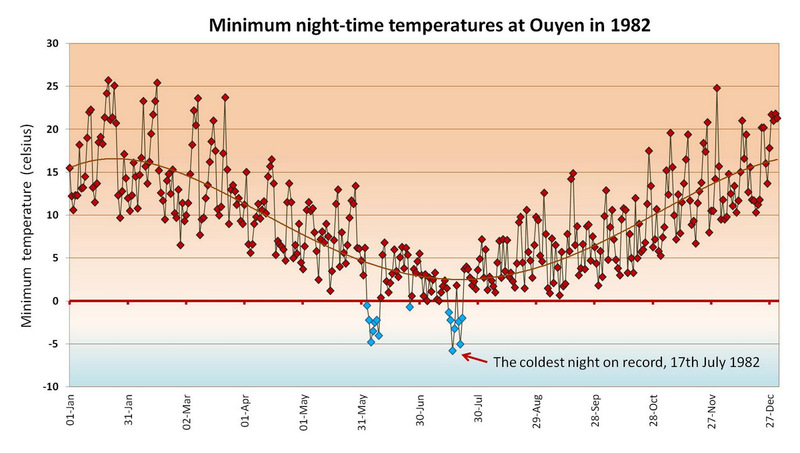 In Ouyen, –5.8°C isn’t just cold on the extremities. It’s cold in the extreme and extremely rare. Since records began, it has happened just once, on 17th July 1982. The cold winter of 1982. Source: Bureau of Meteorology. The impact on the vegetation was dramatic. Thousands of hectares of mallee scrub and heathland were devastated, especially in the interdune swales. The standard technique for measuring temperature is to hang a minimum-maximum thermometer in a white slatted box, 1 to 2 m above the ground. The box is called a Stevenson Screen; named after Thomas Stevenson, a Scottish lighthouse designer (that’s an exclusive niche, I hear you say) who designed the prototype in 1864. The Stevenson Screen. Photo courtesy of Flickr. On winter nights it’s warmer inside the box than out. Cold air rolls past the screen to the lowest point in the landscape. Down past the ankles, to the frost hollows, the swales, between the dunes of mallee sand. Nobody knows how cold it got in the mallee swales in winter ‘82. One researcher estimated –13°C. Whatever the number, the drought-stricken plants hadn’t felt that cold for a long, long time. Have you ever put a lettuce in the freezer? Gourmet salad begone. As the water in a lettuce leaf freezes and expands, the cell walls break, the cells die, and your defrosted iceberg turns to sludge; to something you could drizzle across a salad. Cold-dwelling plants can’t be so hyper-sensitive. They sit in the freezer every winter. Desert Banksia, Banksia ornata, is a short stocky shrub, 2-3 m tall. It grows across the southern mallee from the low swales to high dune crests. The fat yellow honeysuckle flowers feed pygmy possums, honey-eaters, moths and bees. Banksia ornata, the Desert Banksia. Original photo from The Phytophactor. 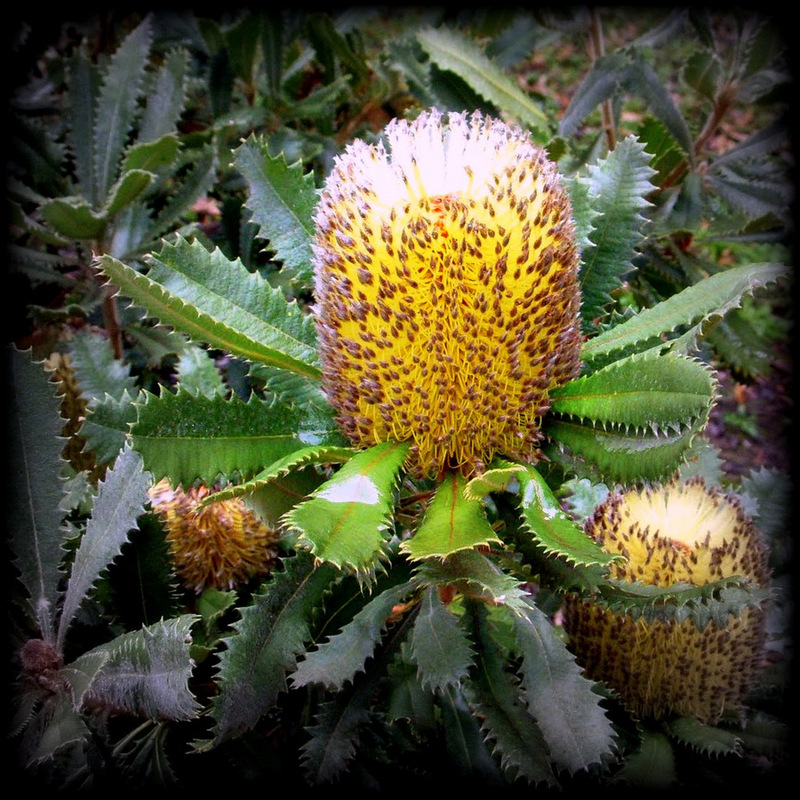 Yet the cold snap of ‘82 broke the banksias. 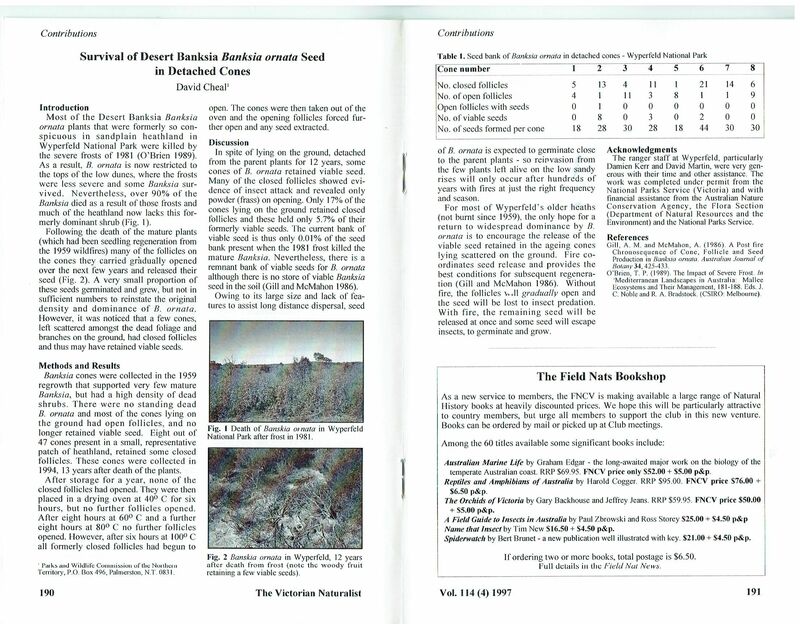 Desert Banksias and other species died across huge areas. Fire, not frost, fuels the life cycle of Banksia ornata. Hot fires kill plants and warm the resin that binds closed their seed cones. The heated resin melts, the cones open, seeds fall to the ground, and new seedlings grow. The frosts of ‘82 failed to melt that resinous glue. Plants died but the cones stayed closed. Few seeds fell to the ground and fewer seedlings regenerated. The Banksias disappeared from the swales; their evidence consumed by fires that later burnt the dead, frost-bitten plants. Could that extreme event, that super-cold frost, occur again in a world of global warming? As temperatures rise, frosts will surely fall. Logical as that may seem, it isn’t happening. At least, not yet. Steven Crimp and colleagues from CSIRO studied weather records from 1960 to 2011 from across south-east Australia. In a new paper, they discovered that frosts are becoming more common, not less common, in inland areas below 100 m altitude; an enormous region that includes the Mallee and much of north-west Victoria and south-west NSW. Growing wheat in the Mallee. Original photo from ABC News. Surprisingly, average temperatures are rising and frosts are getting more common. More surprising still, the frost season is getting longer. The alarming paradox has a cause. Atmospheric circulation systems are moving. As high pressure systems move south, they create clear, cold and frosty nights in the mallee. Which is why it’s so cold on the extremities in our thin nylon tent. Climate change provides no respite from cold nights in the mallee. But what of nights ‘cold in the extreme’? Will global warming mean the end of –13°C in a low mallee swale? Truth is, we don’t know. The story of climate change is partly about changes in average temperatures. But it’s equally a story about changes in extremes. About the increasing frequency of unexpectedly severe events. The rare events that change ecosystems. Events that kill desert shrubs and make bats and birds drop from trees. Events that are increasing not declining. There’s a strange disconnect in an altered landscape. Perched on a mallee dune, resting from our walk, we gaze upon one of the most beautiful, natural landscapes I know. A landscape my brain compulsively re-populates with banksias. A species decimated not by persecution, human folly or greed, but by a change in the weather. What could be more natural? A short bout of extreme temperature, a few cold nights in a thin nylon tent. As we wander, I contemplate the future. How will naturalists and ecologists in the year 2100 think about ecosystems altered by a ‘change in the weather’? Will they, like me, repopulate the view with vanished species? And what new words will they use to describe a world transformed by climate change? Will old terms like balance, equilibrium, intact, local provenance and climax be abandoned as archaic, redundant, quaint? Or, accustomed to constant change, will they behold the most beautiful landscapes they know? And sit and rest, and enjoy the view that we left behind? I have posted a series of photos that show the aftermath of the 1982 frosts in a later post, Bringing back the dead with old ecology photos. All of the photos in the post are from the web. 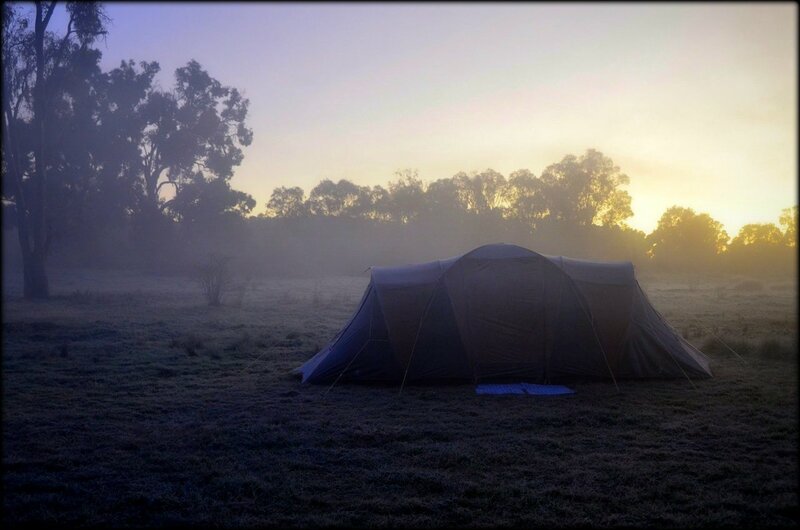 The top photo of the tent in frost is from the Camp in Mudgee website. Cheal, D. (1997). Survival of desert banksia Banksia ornata seed in detached cones. Victorian Naturalist 114(4), 190-191. [full article]. Crimp, S., Bakar, K.S., Kokic, P., Jin, H., Nicholls, N. & Howden, M. (2014). 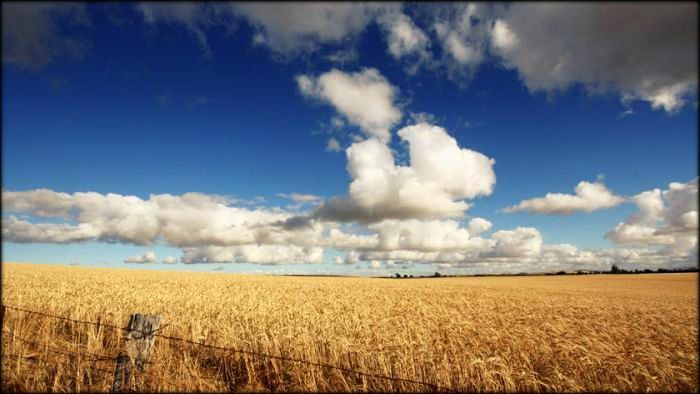 Bayesian space–time model to analyse frost risk for agriculture in Southeast Australia. International Journal of Climatology, early view. GRDC (2014). Frost risk on the rise despite warmer climate [web page]. Great post and a very interesting story. I’ve done a little work on frosts and am gearing up to do some more (frosts are more frequent here in NZ!) and thought I might throw in my two cents. That is very interesting that climate change is causing frosts to be more frequent in the mallee and in other adjacent low-lying areas. There is also evidence from elsewhere that frost impacts on plants are becoming more severe even in areas where frost frequency is declining (see for example: http://onlinelibrary.wiley.com/doi/10.1111/j.1365-2486.2012.02712.x/abstract). Warmer temperatures have led to earlier bud break, rendering some species more susceptible to late spring frosts. Higher [CO2] will also likely lead to increased frost damage (see http://onlinelibrary.wiley.com/doi/10.1111/j.1365-2486.2007.01499.x/abstract). The other thought that I had was that there might be another mechanism underpinning the death of Banksia in the mallee. There are two main ways by which frost impacts plants; 1) ice crystallization causing rupture of cells in leaves; and 2) hydraulic failure due to freeze-thaw embolisms (see this great video for an explanation: https://www.youtube.com/watch?v=d260CmZoxj8&list=UUeiYXex_fwgYDonaTcSIk6w#t=65). O’Brien et al. show that the leaves of Banksia are highly frost resistant, so I wonder if it is hydraulic failure due to freeze-thaw embolism that caused deaths in this species? How does the wood density of Banksia compare with the Leptospermum and eucalypts? Lower wood density would be consistent with lower resistance to freeze-thaw embolism. Finally, I believe that plants that are already drought-stressed are more susceptible to freeze-thaw cavitation, so the severe drought probably played a role in these impacts too (can’t put my hand on the refs right now, but can dig them out if you are interested. Thanks Ian for another great post and thanks Tim for his thoughts also. More food for thought on the impacts of climate change. I for one had not considered extreme cold as being a concern! Keep the blogs coming. I suspect climate change will involve “untempered” temperature ranges – increasing fluctuations between lower minimums and higher maximums, even if the mean changes only slightly. The prediction of means, by itself, never tells the whole story. Ouyen used to be the site of the World Custard Slice Championships for many years I think this deep cold may be caused by them giving up that honour! Seriously though Ian I do have an item to share. In 1982 on our farm on the south coast of NSW we were trying to grow a commercial crop of South African Proteas on a block of sandy swale near a lake edge. We recorded -4 deg one night (though this was recorded in a Stevenson screen too so real temp may have been much lower) which due to a sea mist hanging over the site, that dispelled rapidly as the sun came up, saw the temperature go extremely quickly from below zero to +1 and onwards. The effect was spectacular most of the young seedlings literally burst their stems a few mm above ground level and we lost the entire crop. Cells rupturing is real and nasty to see! Hi Moved to this region from Far East Gippsland ~1000mm rainfall to ~350 mm, just after decadal drought so not a plant in sight, only red sand. Big shock. Also big shock how dead this area was in terms of vegetation removed (>80% which doesn’t deter locals from further clearing) and mammals extinct. Combined with salinity this area is fundamentally dying. Must have been spoilt in EG. Bigger shock to come after 1 in 100 year floods. Summer 2013-2014 severe heat, often thermometer reading >45 degrees, and put on ground >50. I’m near Nyah area over near Murray, but have visited Ouyen a bit, and conversations with locals confirmed my view that the official BOM sites don’t reflect the readings in the area, with less than 45 official readings on days when we were all heading towards 50. Anyhow that was last Summer so if El Nino is confirmed, this Summer will actually be worse. I have to say that a couple of nights ago when you reported the frost was nothing here compared to tonight, although there have been some very cold nights and I have noticed a number of frosts. I am upgrading quals and tried to do a study which could lead to insights into biological crusts, succession and evaporation at Lake Tyrrell after THAT summer. But of course it teamed down and I was stuck in the mud and the lichens seemed to be in very poor condition! So other than the evaporation issue which it is clear to me is a huge driver in Australia, much underestimated, although Raupach et al from CSIRO noted that it is influential in northern Australia whilst rainfall is the driver in southern Australia, seasonality is stark here, really stark. I suspect the lichen crusts thrive in summer and the mosses thrive in winter and they have it all arranged. Evaporation of retained soil moisture is severe in Summer and as you point out the frosts can also be severe. However in East Gippsland frosts lasted well through the morning, which they don’t here, and it was so cold in the Winter that Currawongs migrated down to the coast where I lived, so you always knew when Winter arrived. I personally think the mallee in northern Vic verges on being classed arid rather than semi-arid. With regard to climate change I looked at the 80 year forecast on Climate Wizard which uses IPCC I think, and there appears to be a change for Australian arid regions which means increased temperatures but also increased rainfall, but that ceases around about the Victorian mallee. This may therefore be a transitional climatic zone of some sort, which I guess means semi-arid rather than desert. The joys of such a semi-arid transition zone are thus cooking in summer and freezing in winter, with very little moisture. Therefore frosts and dew are essential to plant survival, but as with xeromorphic adaptations to heat, there is only so much tolerance ability. So with increasing extremises, particularly without the 80 year increase in precipitation, but with the reduced vegetation cover and salinity, means a bit of a horror ahead for this region. In the meantime the call is for the regional increase in human population to occur here, in spite of the existing stresses on the Murray. There is no endemic water whatsoever here, all water comes from external streams and limited rainfall, so generally overnight dews and frosts are a good thing. Soil carbon is largely derived from biological crusts in arid areas, and these must have soil moisture to photosynthesize. The disturbance to these from grazing etc. given that >60% of Australia is rangelands with limited soil C dependent on biological crusts is a national catastrophe. What is really likely here is increased desertification, but although we are a signatory to the convention, apparently we feel the problem is “somewhere else”. The truth is that most of the population in Australia is somewhere else than the main zone and there is little concern for these regions in the mainstream. It’s a little difficult to have a convincing argument about climate change though if one is literally shivering! You’ll have to forgive me for blowing my own trumpet, but I don’t often get feedback this enthusiastic from the interwebs. Thanks Tim! Hi Tim. I’m sure they do! Many decades experience of seasonal changes + having your livelihood depend on it would sure sharpen the observational skills. Interesting changes in frostiness (and plant responses) as a result of overal warming. As we are experiencing record lows on the Atlantic Coast of North America, the experience you’re sharing here is particularly salient. A lot to unpack.